We’ve already had a recent look at the insane dangers of carrying loads without securing them properly. Well, this is what happens when you fail to strap stuff down properly in an articulated lorry. It wouldn’t normally be funny to watch a truck shed its load all over a road. The disruption that causes is a pain in the backside. But in this case, we’ll make an exception. 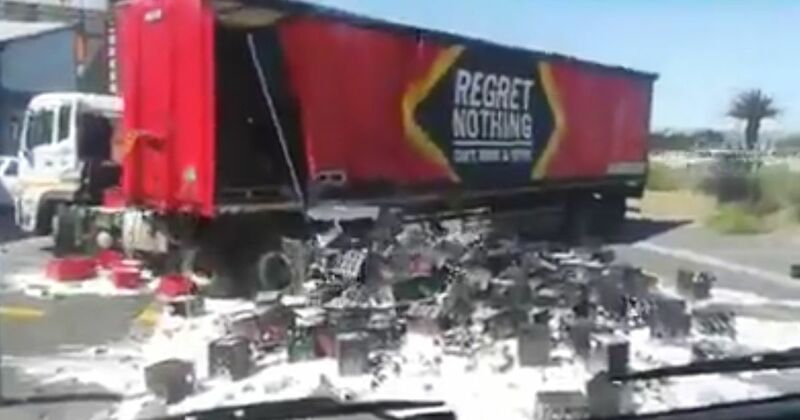 The truck in question, somewhere in Russia or Eastern Europe guessing by the accents of the people in the camera car, is emblazoned with a ‘Regret Nothing’ anti-drink-drive message. Its driver has been unable to turn the truck around in the available space and has jackknifed the trailer. Then he tries to jerk his way out of the problem… and the rest you can see for yourself. Regret nothing, right?